How do I Identify Factory Marks on Antique Vases Made in Italy? Antique vases from Italy were made from pottery and porcelain. The makers carved their marks into the wet clay, or often stamped their mark on the bottom of vases. Different regions in Italy have distinctive marks that were placed on the bottom of vases. Capodimonte porcelain is stamped with a distinctive crown mark over a capitol N. The N stands for the Royal Factory in Naples, Italy, and is easily identifiable as the Neapolitan N.
Turn the vase over and look for a mark on the bottom. Place the vase under a high powered magnifying glass to study the mark. 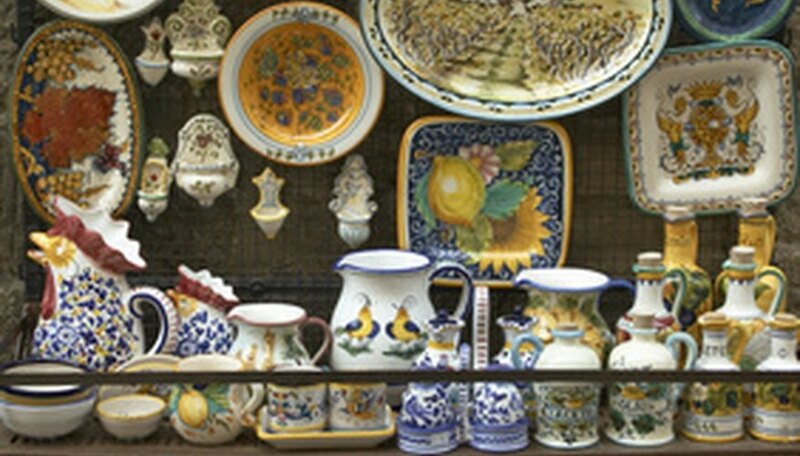 Majolica can be described as Italian earthenware coated with enamel, which is sometimes luster coated. The bottom where the mark is may be unglazed. Look underneath a vase for numerals with makers initials. Antique majolica vases will generally be numbered and marked like this. Seek out reference guides online to pottery and porcelain marks, such as the one included here. Study the sections on Italian pottery and porcelain marks to find a match to the mark on your vase. Write down the information you find about the marks, and take notes about the maker, and characteristics about the mark. For example, some marks may also be raised on certain antique vases, aside from carved in pottery, or stamped onto a piece of porcelain. Go to the local library and research the maker and marks in guidebooks for Italian pottery. Become familiar with various types of antique Italian vases; what they look like, how they were decorated. Check museum guidebooks written about Italian antiquities. These guides often have photographs included, and give detailed descriptions about characteristics of markings on old Italian pottery. Look at websites where professional antique dealers, those with experience selling antique Italian vases, have their wares listed. Usually they have more detailed information for antique Italian vases up at their websites, with good close up shots of marks. Compare those markings online to your vase. Take your antique vase to a professional antiques dealer for an appraisal. Find one who is familiar with the type of piece you have, and always choose an expert if possible. Go to a dealer who is accredited with an antiques dealer association, with a special emphasis on pottery. Get the most accurate and fair quote of worth by going to these more seasoned dealers for an appraisal. Beware of antique dealers who properly identify the vase mark, and offer to buy the piece, especially if offering a low price. Check current up to date price guide books for antique pottery at local bookstores.